Photographs of stained glass windows by Glenn Lewis © 2009/glennlewisimages.com. Text copyright © 2007 Pittsburgh History & Landmarks Foundation. Photograph of The Church of the Redeemer © 1998 William Rydberg PHOTON for Pittsburgh History & Landmarks Foundation. As the craftsman selects the pieces of colored glass and puts them together in various combinations, he becomes more and more fascinated by the infinite variety of effects to be obtained, and to have a profound love and respect for the material that makes this possible. Despite its comparative youth—Pittsburgh’s Episcopal Church of the Redeemer was designed and built 1936-37—the building incorporates earlier structures erected after the parish was established in 1903. According to James D. Van Trump, the principal structure, a stucco building of 1913, was “turned around, set on new foundations, encased in Gothic stone work, and a stone tower was added.” The new building cradles the old. The Church of the Redeemer, in Jamie’s words, exhibits “a fineness of scale and proportion and an amiable forthrightness of aspect that make it one of the best things of its kind in Pittsburgh.” The same might be said of the stained glass windows, created over more than two decades by one craftsman, Howard Gilman Wilbert. Wilbert was born in Pittsburgh and attended Stevenson Art School, operated by Horatio S. Stevenson, a respected Pittsburgh painter who had studied in New York and Paris, and became the first president of the Associated Artists of Pittsburgh in 1910. That same year Wilbert began an apprenticeship with Pittsburgh Stained Glass Studio (founded in 1904 and still in business). After serving in World War I, Wilbert worked with Charles J. Connick in Boston for over a year before returning to Pittsburgh and his old firm. He became a partner and served as chief designer for 35 years. 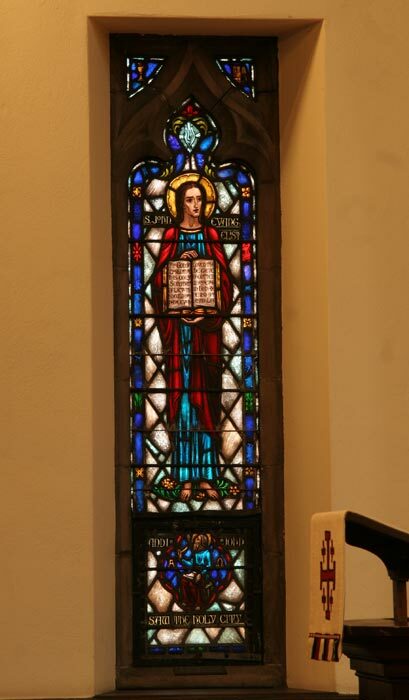 Wilbert was a parishioner at the Church of the Redeemer and he and the rector, Hugh S. Clark, planned the iconographic program for the windows, all of which Wilbert designed and made between 1939 and 1962. The nave windows depict Biblical figures, such as Saint John the Evangelist (shown here) and St. Joseph of Arimathea, and saints of the British Isles: S.S. Cuthbert (shown here), Aidan, Oswald, Columba, Finnian, Brennan, and Patrick. Other notable Wilbert glass in Pittsburgh includes windows at the Church of the Ascension (1918), East Liberty Presbyterian Church (c. 1931-35), St. Andrew’s Episcopal Church (1961-62), and contributions to windows in the Hungarian and Russian Nationality Rooms and the Stephen Foster Memorial at the University of Pittsburgh. One stained glass window in the Church of the Redeemer not by Wilbert is the sacristy window by Connick Associates of Boston in memory of Hugh S. Clark (1903-1992). The architect of the Church of the Redeemer, E. Donald Robb (1880-1942), apprenticed with Theophilus Parsons Chandler and Cope & Stewardson in Philadelphia and worked in both the Boston and New York offices of Cram, Goodhue & Ferguson. (Robb prepared the presentation drawing for Bertram Goodhue’s First Baptist Church in Pittsburgh.) Robb left CG&F in 1911 to form Brazer & Robb [1911-14] with Clarence W. Brazer. Robb returned to CG& F in 1914. Sometime after 1918, Robb formed a partnership with CG&F employee Harry B. Little (1883-1944); they were joined by Philip H. Frohman (1887-1972). 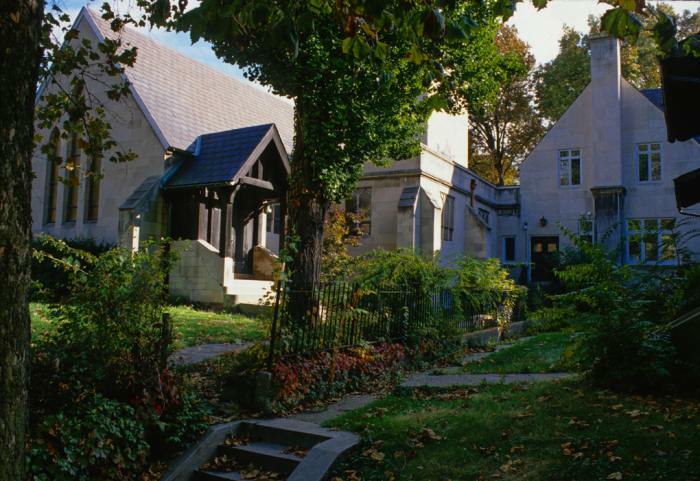 Frohman, Robb & Little is best known for completing the Washington National Cathedral. Sources: Howard G. Wilbert, “Charles J. Connick: Stained Glass Craftsman and Friend,” Stained Glass 41 (Autumn 1946): 76-79. 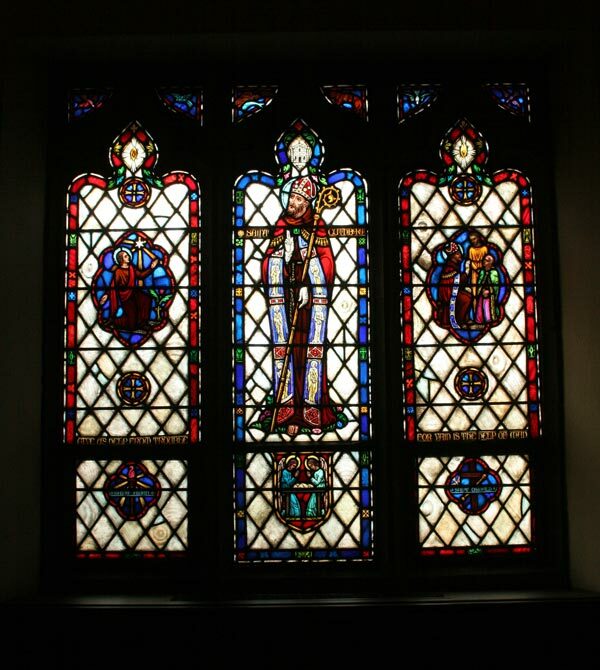 Hugh S. Clark, The Stained Glass Windows in the Church of the Redeemer Pittsburgh (Pittsburgh, n.d.). James D. Van Trump and Arthur P. Ziegler, Landmark Architecture of Allegheny County Pennsylvania (Pittsburgh 1967): 107-108.